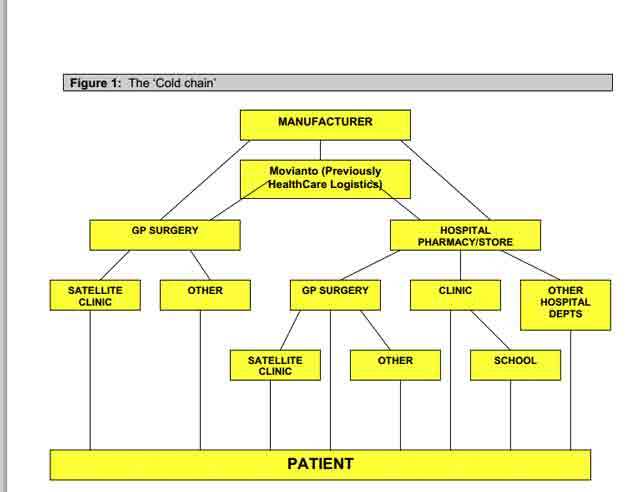 One of the often assumed correlations is between being cold and being sterile. When we think of a cold room the automatic assumption is that it is also clean and sterile. So what happens when this goes wrong? Here is a PDF which looks at the problems when you get biological contamination. The solution ? Hydrogen peroxied gas to kill all the germs! This is a very toxic substance and calls to mind some of the poison gases used during WW1. So not to be done lightly but it does seem to have worked. The cut flower market is massive.But there is then the problem of preserving the flowers between their harvesting and arrival at the market. The optimum temperature for storage of the majority of fresh cut flowers is 32-38 F, with a relative humidity of 90-95 percent. This temperature/ humidity combination lowers respiration and transpiration of the flower. It also slows growth of fungus and production of ethylene. You shouldn’t store the flowers with vegetables as the ethylene which is produced can decrease the life of the cut flowers.There are specific procedures to decontaminate a storage unit which has previously been used for fruit and veg. For instance specialist filters can remove the remaining ethylene or failing this a simple bleach solution. 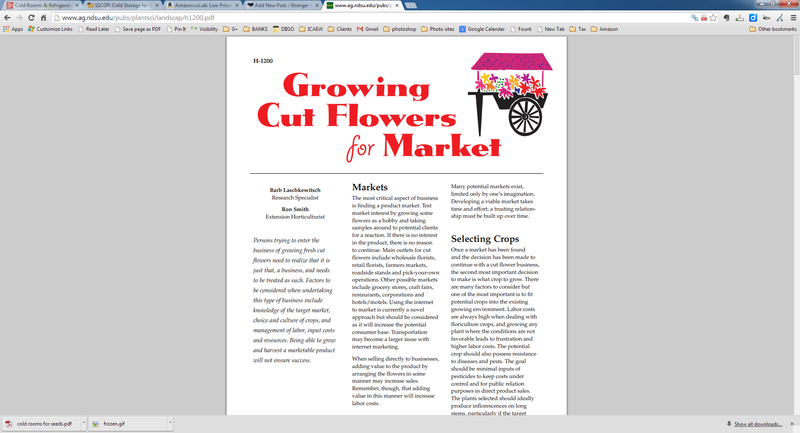 Are we really looking at ministore cold rooms for flowers or more likely refrigerated units or trailers? 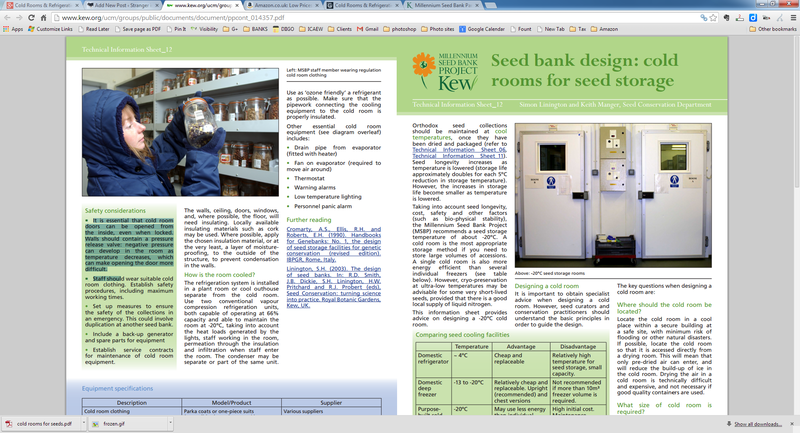 The millennium seed bank project is the largest ex situ plant conservation programme in the world. By 2020 they aim to have 25% of the worlds plants preserved. But how do you actually preserve the seeds? 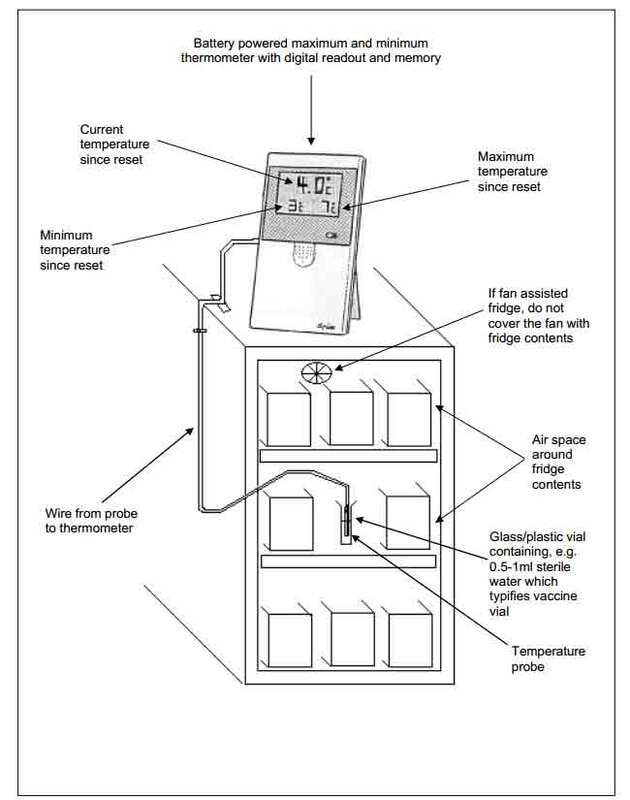 What temperature should they be kept at and what are the design challenges? Well Kew Gardens have published a very interesting summary of the cold room challenges here. Here are some of the take aways. Optimum storage is at minus 20 degrees C.For every 5 degrees reduction in temperature the seed storage life will double. But the impact tails off and taking into account things like energy requirements and so on the minus 20 degrees is optimal. 3.Industrial cold room around minus 20 degrees C.
4.Liquid nitrogen is minus 160 to – 200 degrees C.
For more information on Cold rooms click here. 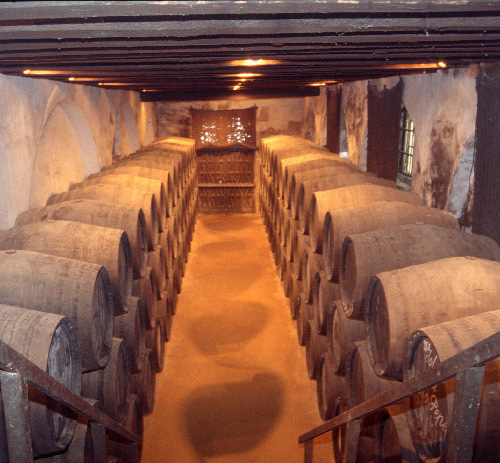 Before we had refrigeration wine was typically stored in cellars or maybe a cave. Constant temperature and humidity are really important and this was an easy way to guarantee it. An ideal range would be between 7 to 18 degrees centigrade.Apparently if the variation in temperature is too much the wine will tend to breathe through the cork and ageing will be speeded up. Reference this blog article on wine cellars. We all know that fur protects against the cold but when it comes to clothing made from fur, such as fur coats, not many people realise the importance of correct, temperature controlled storage. If the temperature is not controlled in the environment where a fur is stored then microbes already within the fur can have the chance to eat away and potentially destroy all the fur. According to this article on how to care for fur coats, the best temperature for fur storage is 45 deg F. Then there is the question of humidity – yep, that’s just as important and it should be 50%. 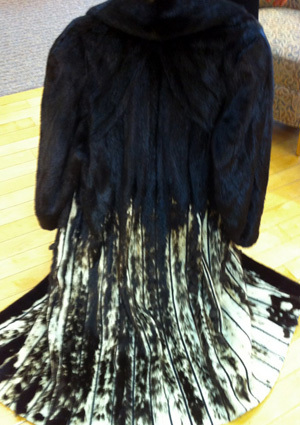 Protecting against too much light or heat is also a big consideration if you want to avoid the fur fading. On reading up on the subject it seems that if you want to store a fur coat properly you should NOT try to store it at home just in a normal closet. Nor should you be tempted to think that air-conditioning in your home will help! Apparently if you want to be sure about the preservation of your fur, you have 2 choices. Choice 1 – you contact a professional fur storage facility who offer the service to the general public. Ideally get a recommendation from someone you know or alternatively just do a Google search and check out a few of the many companies that offer this service. Choice 2 – you contact a cold room supplier who can offer you a bespoke solution of a small climate control storage unit of your own. Obviously this is a more expensive option and will depend upon the size of your wallet!